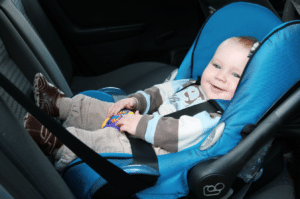 Navigating PA car seat laws for your little one? One of our Center City pediatricians answers some of the most common questions our office receives. Many of us are familiar with the challenges of buckling a child into a car seat, but the importance of doing so can’t be understated. Age- and size-appropriate car seats, booster seats, and seat belts reduce the risk of serious and fatal injuries for our most precious cargo. As pediatricians, we try to help families navigate the world of child passenger safety. But as parents, we also know how confusing this topic can be! There are so many types of car seats. How do we choose the one best for our child as he/she grows? 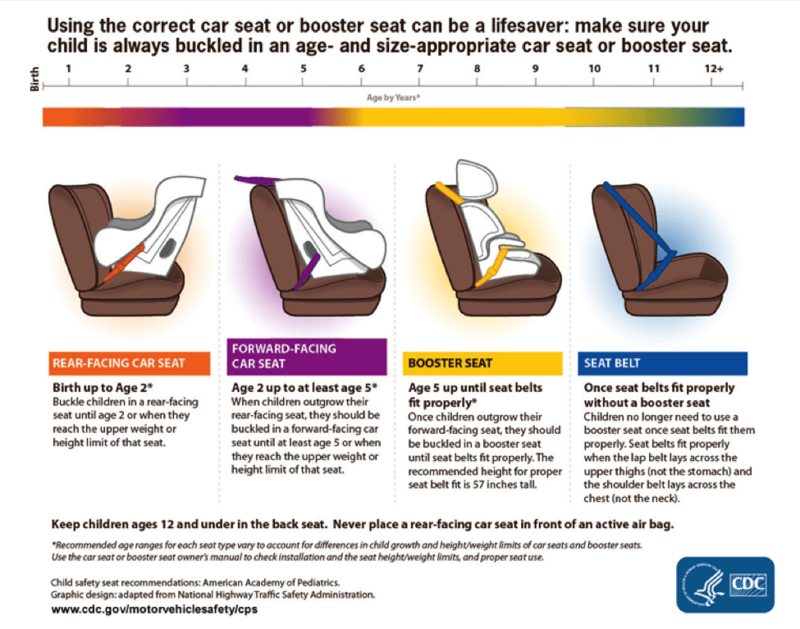 The chart below from the CDC is helpful for understanding the different types of car seats and when each is best for your child. Kids now must rear-face until AT LEAST age 2, no matter how tall they are. Refer to your specific infant seat’s height and weight requirements as to when your child needs to move into a backward-facing convertible car seat. Our family doesn’t own a car. What do we do about car seats? Living in the city, this is a question that comes up often. It’s easy enough to bring your infant car seat around in the early days, as it often snaps into strollers and can be installed without its base in cabs (“European style”). However, when kids outgrow the rear-facing-only infant car seat, what can you do when you need to take a car somewhere? Many families purchase a cheaper, lightweight convertible car seat to keep at home for trips in Zipcars, Uber/Lyft rides, or cabs while kids are rear-facing. This can be used forward-facing once the child outgrows the rear-facing position. UberFamily is available in a few select cities, conveniently including Philadelphia! Each UberFamily vehicle is equipped with an ImmiGo car seat that is designed for only forward-facing passengers. In the case of UberFamily, kids are allowed to ride forward-facing as young as age 1 (and above 22lbs) despite the law requiring rear-facing until age 2; this is the case because being harnessed in this seat is a safer alternative than being unrestrained or improperly restrained in such a vehicle. The ImmiGo is also a lightweight, portable car seat option for families who use vehicles minimally. It may be installed forward-facing only in cars with the LATCH system. 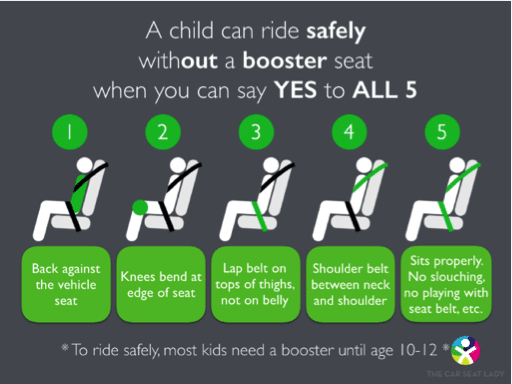 As children grow and become old/tall enough, booster seats can be moved between cars easily. For families that rely on a variety of vehicles, the BubbleBum is an inflatable booster seat that’s a great compact portable option. Dealing with kids’ coats and car seats in the winter is tough. What should we do? It is safest for children never to wear wear a puffy coat, bunting, or “BundleMe” blanket while riding in a car in a car seat, as all of these leave extra room between the child and the seat. The average puffy coat adds 4 inches of slack into the harness. In the event of a severe crash, these extra inches can mean the difference between staying safe and sustaining severe injury. For more tips and info on how to best keep kids warm in car seats in the winter, I defer to The Car Seat Lady.